You know how it is. You want some Taco Bell, but don’t want to get up off the couch. It happens. GrubHub has your back. Taco Bell is now offering nationwide delivery in partnership with GrubHub. The chain already tried delivery in a partnership with DoorDash, but the GrubHub partnership will operate at a larger scale. 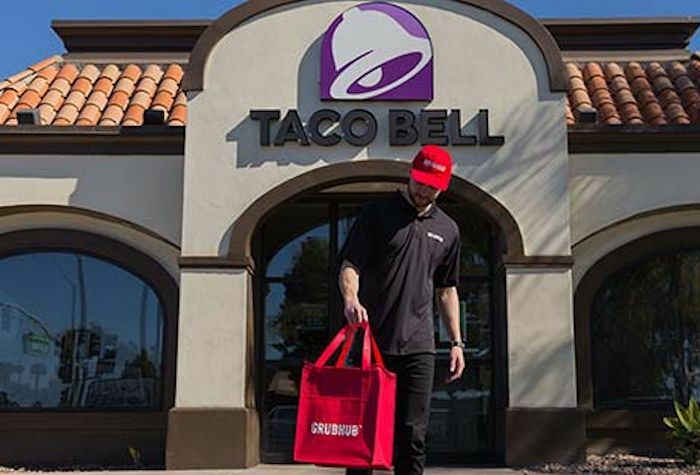 Taco Bell officially announced national delivery via GrubHub and is offering free delivery for all orders over $12 excluding tax for a limited time. To make the experience faster, Taco Bell has integrated its sales system directly into the GrubHub app. So pickups are timed to the moment an order is ready so that it can be delivered to the customer hot and fresh. It doesn’t get better than that. A US partnership between Yum! Brands and GrubHub was announced last year to speed up online ordering for pickup and delivery. That partnership has resulted in this delivery service. GrubHub says that it will add extra drivers in areas near a Taco Bell location so that the orders can be delivered to customers faster. This is all great news for fans of Taco Bell. Visit tacobell.com and enter your zip code to order. You will be redirected to GrubHub. You can also do the same through GrubHub’s website or its mobile app to place an order at the nearest Taco Bell restaurant with delivery. So get yourself some food!